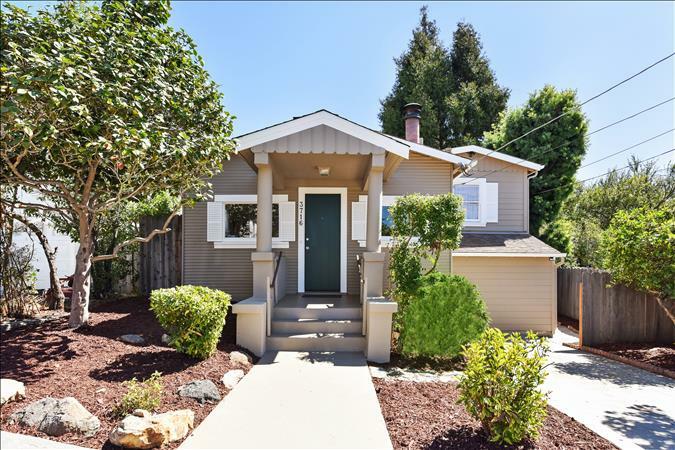 Charming 1924 California bungalow, featuring spacious rooms with a split-level floor plan. The front porch welcomes you to the entry into a bright living room with brick fireplace above a raised hearth. Book shelves on both sides of the fireplace provide display area for your treasures and books. The adjacent dining room provides the opportunity for entertaining. There is recessed lighting in both the living room and dining room. The eat in kitchen is roomy with lots of cabinet space and a garden window. The upper bedroom opens to a sunny deck - a perfect spot to relax after a busy day. The newly carpeted lower bedroom offers a large walk-in closet fitted with organizers. A remodeled bathroom is a plus with modern large tile surround and floor. Off the kitchen is the laundry room and access to the back outdoor area. Red oak flooring in the living room, dining room and one bedroom. The private outdoor area awaits your green thumb. Off street parking and easy access to freeways 13 and 580. Minutes away from shops and restaurants The walk score is 76. Shared listing with Wendy Ferrari, Pacific Union.